Greg and I found the Greek Islands Grill restaurant via a penny saver type magazine several years ago and have been enjoying it on occasional Sundays ever since. They were advertising a Sunday brunch Greek buffet. What could be better we thought. We were pleasantly surprised with the buffet’s offerings- though there were not countless dishes available, the ones they did offer were fabulous and hit the spot for the Greek food craving we have so regularly. According to their website the buffet is also offered on other days besides Sundays- “All you can eat buffets Wednesday (5 to 9 p.m.) and Sunday (11 a.m. to 3 p.m.) are $13.95. Thursday’s lunch buffet (11 a.m. to 2 p.m.) is $9.95.” . It’s a slight hike out there to the restaurant (technically it’s in Cloverly) but we have found it to be very worth it! Almost every time I go, it’s the only meal I eat all day. For the Marylanders out there, Greg and I definitely recommend this place. We have never ordered anything off the menu so I can’t speak much for that. However, the buffet gives you the chance to try several different things at once and it has always been very fresh and hot. They change out the food regularly and the service is friendly and prompt. I hope you like it as much as we have– we will miss it! 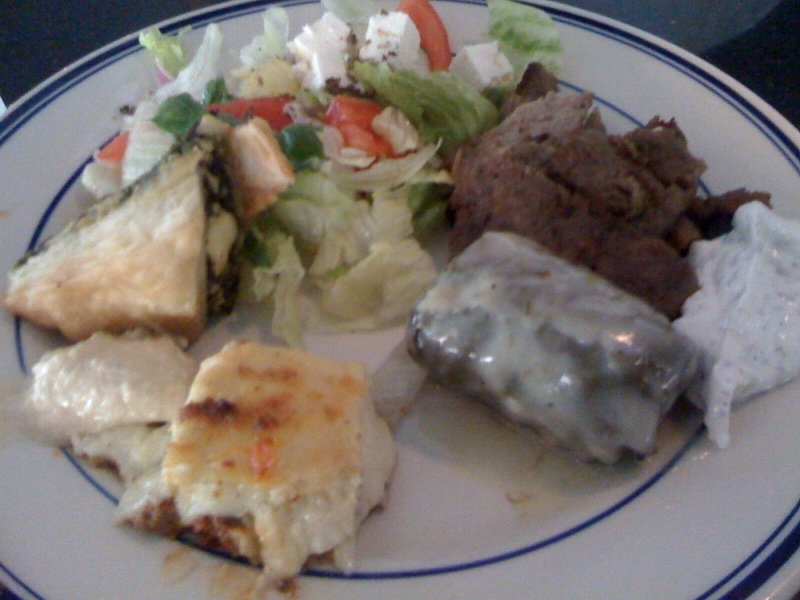 This entry was posted in Restaurant Reviews and tagged Buffet, Greek, Greek Islands Grill, Maryland, Silver Spring restaurant. Bookmark the permalink.